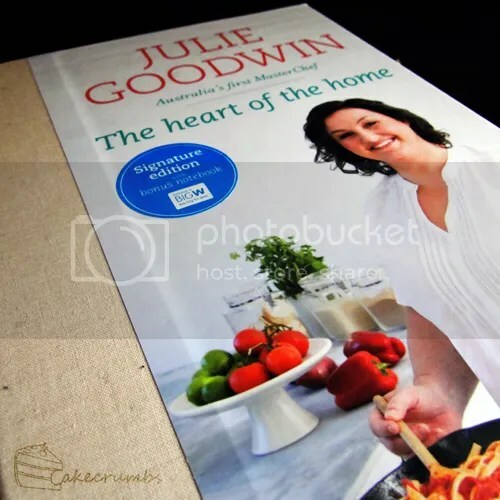 Julie Goodwin's cookbooks are amongst my favourite. This is her second. They are littered with personal stories, quotes from family members and delicious recipes that come from her family. The last chapter is left blank so you can fill it with those from your own family. The recipes themselves are always so homely. Nothing new and fancy and designed to push the envelope. Just heart warming, delicious meals whose sole aim is to accentuate good times spent with loved ones. 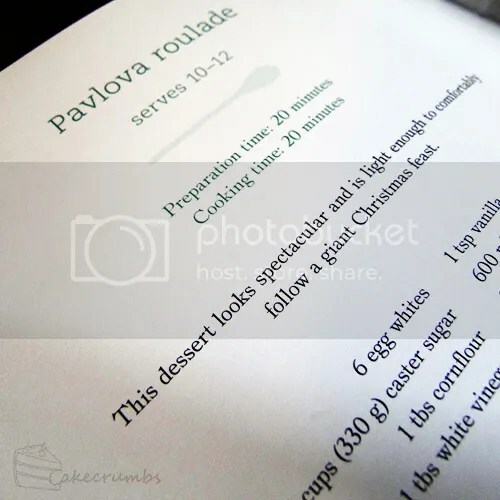 Her methods are written in a conversational style, often explaining aspects that may be new to a reader, or adding notes about serving suggestions or how much of the dish can be prepared in advance to allow more time with guests. Along with Julie Goodwin, pavlova is another of my favourite things in the world. For the uninitiated, a pavlova is a meringue-based dessert that is a staple amongst Australian and New Zealand national cuisine. A good pavlova meringue has a crispy exterior but is soft and marshmallowy on the inside. It is then typically topped with cream and fruit, but it is open to additions. Additions that usually involve some form of chocolate. I like adding broken up Flake or Peppermint Crisp to it, preferably by folding it through the cream. It's such a delicious, refreshing dessert and always the first thing I make a bee line for. So when I saw her take on it, I just couldn't resist. I've never attempted a roulade of any sort simply because I foresaw it cracking and collapsing all over the place. I don't know what possessed me to think it was a good idea to do it the first time with meringue, least of all a pavlova meringue which is notorious for cracking at the best of times. Perhaps it was my love of pav, or the fact the point of Cook Book Challenge is supposed to be to challenge myself. I did the daggiest kitchen dance of all time when this worked. I was so exited. Not only did this not collapse, the whole process was much easier than I expected. Once my excitement died down, I then had to resist eating the whole thing before the guests arrived. But I couldn't resist taking a single slice first. You guys love dissected shots, right? It's was for the good of the blog! Honest! In the bowl of an electric mixer, beat the egg whites until soft peaks form. Add the sugar a little bit at a time, beating constantly, until the sugar is dissolved and stiff peaks form. Sprinkle over the cornflour, vinegar and vanilla and gently fold through the egg whites until combined. Do this very gently! Spread the mixture into the baking tray and bake for 20 minutes or until just firm. Meanwhile, slice half the strawberries and save the rest for serving. When the meringue comes out of the oven, allow to cool for 5 minutes. 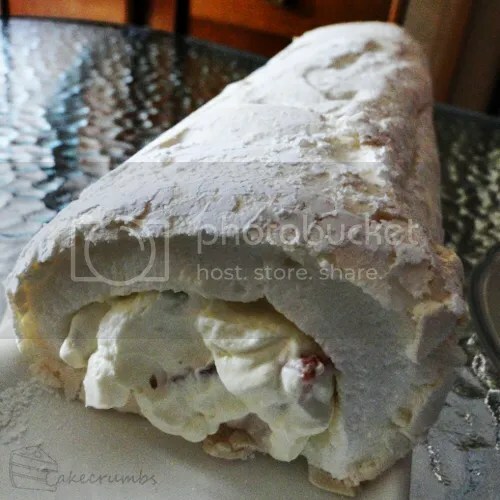 Sprinkle a fresh sheet of baking paper with cornflour and lay it over the top of the meringue. Place a clean tea towel on the bench, and carefully turn the baking dish upside down so that the meringue comes out on top of the baking paper/tea towel. Carefully remove the baking paper from the bottom of the merinue. Spread half the cream in a line along the long edge of the meringue cloest to you. Press the sliced strawberries into the cream. Now the fun part — carefully, using the tea towel as a helping hand, roll the meringue over the cream until it looks like a log. Carefully lift onto a serving plate, putting the join at the bottom. Serve with remaining cream and strawberries. 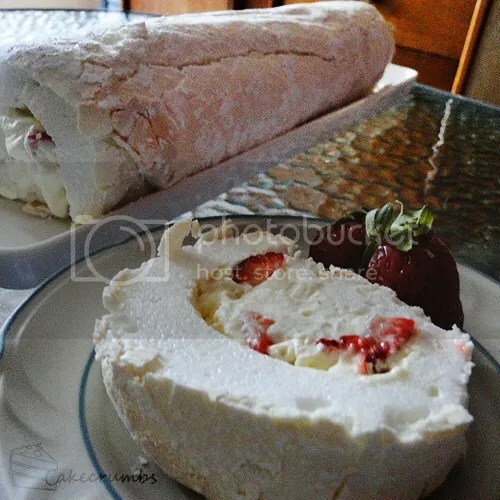 Note: You can assemble the roulade up to 4 hours in advance, and refrigerate. It should be eaten on the day it is made. if you like, spread remaining cream on the top, and arrange quartered strawberries on the cream. Pomegranate seeds make a beautiful garnish. I didn’t realise this came from Julie’s book. This was very refreshing and delicious. I always love pav, but think I like it like this even more so. I was gonna do it for Christmas but thought it might be too much. It’s so quick and simple to make, I think it’s gonna be the staple pav from now on.